As you might expect, the inflight bar on Air New Zealand is pretty good, particularly if you enjoy wine. The Kiwis do a mean drop, and aren't afraid to show it off. 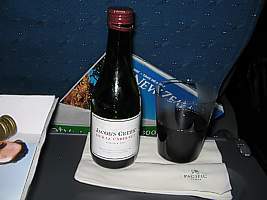 Domestic There is no bar service on domestic flights, except for domestic KoruHour flights in the evenings between 4:30pm and 7pm, on flights between Auckland, Wellington, Christchurch, Dunedin and Queenstown, when there is free wine and beer. Trans-Tasman or to the Pacific islands, if you buy a Works or Works Deluxe ticket you get a free bar. 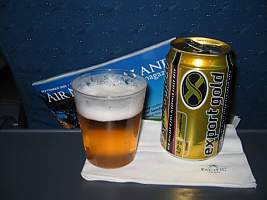 Everyone else in the cabin has to buy drinks from the In-Bites inflight menu. Prices are in New Zealand dollars and the crew often don't carry much change. Other than that you'll have to use a credit card, and beware that you may get hit by huge overseas transaction charges unless you have a NZ credit card. Longhaul (to Asia and the US direct), it's a question of you get what you pay for. 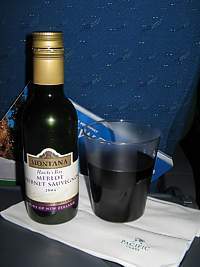 There is a free bar in economy, and all wine in economy comes in 187ml bottles. 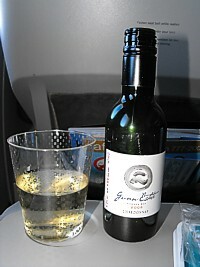 Premium economy gets access to the Business Class wine list, but with a plastic glass. 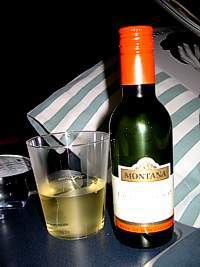 However there is also a Premium Economy Galley bar, where you can go up and get snacks inflight, and help yourself to Business Class wines. Premium economy on Air NZ really is moving very close to Business. However the Long Haul Business Class bar on Air New Zealand is great. After take off you can ask for the winelist (this isn't offered; you have to know to request it) which is a big thick book with plenty of detail on the wines you are about to taste. In business real glass glasses are used, and they are of a novel design. They are self-righting! On all new aircraft there is also a new wine bar area in Business Premier. It is at door one on the Air New Zealand Boeing 777, on the front left, and offers wine tastings in-flight. Fresh white flesh peach and citrus blossom with hints of dried pineapple. The palate is fresh and clean with flavours of peach and rockmelon, it is well balanced with a clean lingering finish. The wines of the Gunn Estate are noted in Kiwiland for thier uncomplicated, early drinking style with pure fruit expression. And for their "value for money". Clean, light style red with little overt oak. A little lively, green-stalky New Zealand herbal and well worth gentle warming in winter to avoid sharpness. A pleasant, well-priced quaffing red; ready but no hurry. There's nothing subtle about this one. It's a bit shy of being a fruitbomb but it has plenty of fruit. While not sweet, it's quite a bit off-dry but this isn't a deficit. It is a pleasant quaff with a fairly long finish. Compared to competitors Penfolds and Rosemount I'd probably prefer this. Nothing complicated here, just a pleasant juicy quaff. Another red which pairs well with those trans-Tasman grilled sandwiches. 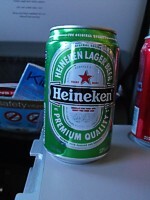 Steinlager Pure is only served in business class. It has a much cleaner dryer finish than normal Steinlager. Steinlager Pure uses a selection of New Zealand's finest hops, including a new variety called Pacific Jade specially commissioned by Steinlager. Steinlager is a lager with a distinctive grassy note and clean crisp bitterness of green bullet hops. It is balanced with a dry, astringent finish. You can normally get through about 10 of these on the hop from LHR to LAX. This beer has a great history. In 1958, New zealand was in a financial crisis. The Minister of Finance, Arnold Nordmeyer, introduced what was to become known as 'The black budget'. 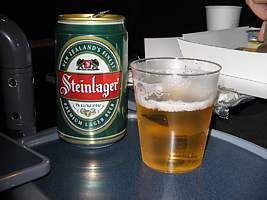 He planned to cut international beer imports and laid down the challenge to New Zealand brewers - 'come up with an international style lager beer'. As a direct response in the same year Steinecker was born and shortly after, in 1962, changed its name to Steinlager as a legally required measure to provide clarity between Heineken and Steinlager. In 1973 Steinlager saw the opportunity for export sales and America was the first target. An American design consultant made two suggestions for Steinlager to become successful in the American market. First, that to succeed internationally Steinlager should be in a green bottle, as this was where the battle for premium beers was fought. And secondly, that Steinlager needed a six pack to tap into the lucrative overseas supermarket trade. 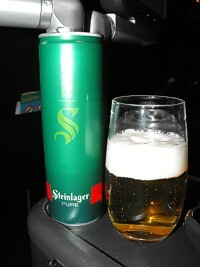 So, the famous green bottle, now synonymous with Steinlager, was born. True to its Export Gold name, this 4% alcohol beer has won several gold medals at the International Brewing Awards in the UK. Speight's Gold Medal Ale, is a full strength bitter ale with a hint of "grassy" undertones that add to its complexity. Probably the least sweet of all New Zealand mainstream brown beers, this characteristic allows the full flavour of the malt and hops to shine through, and it can be a bit of an aquired taste, particularly for Aussies. However the use of Speight's malts and hops produces the full flavour that has been synonymous with the Pride of the South Island since 1876. Gold Medal Ale is the traditional beer of students at the University of Otago in Dunedin, New Zealand. 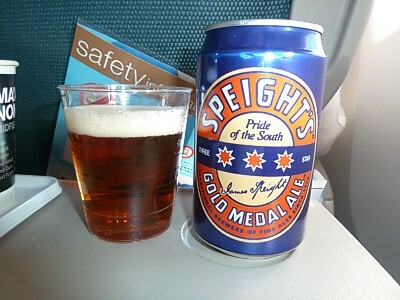 Speights is of course a brewery in Dunedin, New Zealand, but since a fire destroyed the Dunedin bottling and canning plant much of it comes from Auckland. Speights is famous for its promotional branding based on being 'a real southern man' and being 'the pride of the south'.